After getting funded in only two hours on Kickstarter, we knew we had to get Sermonary in the hands of pastors as soon as possible. On September 12th, we opened up Sermonary Beta to the public. Since then, reviews have started to come in, and we wanted to share a few of them with you. You have heard us talk about Sermonary, but you don’t have to take our word for it anymore. Churchtechtoday.com – Read full review here. Propreacher.com – Read full review here. Rookiepreacher.com – Read full review here. Brandonmorrow.org – Read full review here. We are adding new features every month to Sermonary, so it’s going to get even better as time goes by. In fact, we just doubled our development budget so we can implement new features much quicker. If you haven’t tried Sermonary yet, you can test drive it now for free for 30 days. After that, it’s only $9/month. Who doesn’t want to revolutionize their sermon prep for two Starbucks drinks (or one if you are like some of my pastor friends)? 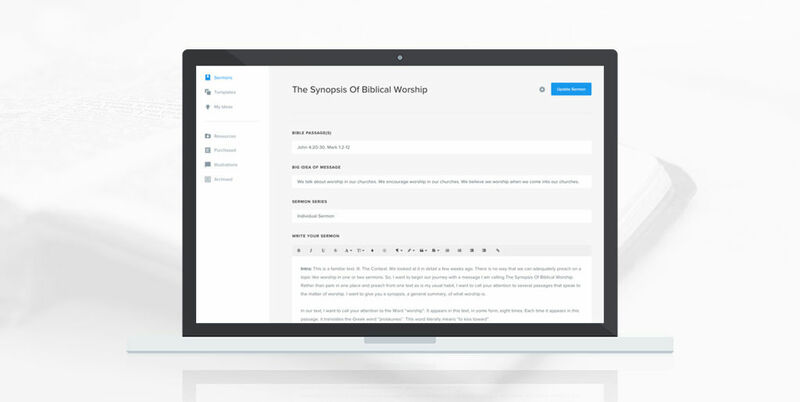 We are excited to make sermon preparation easier for every pastor. Coming soon: Bible translations directly in Sermonary. Subscribe to the Sermonary blog to get email updates whenever we post new content! I have a promo code I want to use! Yes, Add Event Sermon Templates! SPECIAL OFFER: Sermon Templates for Every Church Event (Wedding, Graduation, Baby Dedication, Funeral, Easter and Christmas) ONLY $10.